We make it a habit to not look up pricing of a product before reviewing and if we had to guess the price of the Taotronics TT-BH22, we would have guessed it cost $150. We were shocked to find out that the MSRP for the TT-BH22 is $70 (£60, about AU$86), and can regularly be found for even less online. 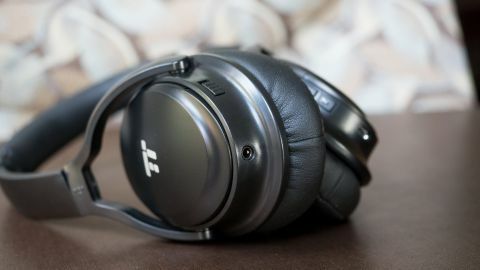 The reason we were shocked by the Taotronics TT-BH22’s price was because you get a lot of features for very little money: The TT-BH22 feature active noise cancellation (ANC), which is unheard of in this price range, and on top of that, you get a rated 25 hours of battery life. Sound is also good for the price ... but there’s one big caveat that we’ll go into more detail on later. That being said, if you’re looking for a pair of headphones with ANC and don’t want to shell out $200 for the excellent Plantronics BackBeat Pro 2 or the even more expensive Bose QC 35 II, it’s hard to think of a better choice than the Taotronics TT-BH22. Here’s why. The TT-BH22 is an unabashed knockoff of the Bose QuietComfort headphones, but if you’re going to copy a pair of headphones, they’re the ones to copy. That said, build quality is just mediocre: Everything is made of plastic and using the headphones result in a cheap feeling and sounding and hollow plastic thunk. For example, pressing the playback buttons on the right earcup result in a harsh, plastic-y click. However, the cheap build is saved by the use of leather on the headband and earcups. Combined with the lightweight plastic, the Taotronics TT-BH22 is actually quite a comfortable headphone, which was a nice surprise. The earpads aren’t nearly as soft as the Bose QC 35 II, but they’re close. On the left earcup you’ll find a 3.5mm jack to allow for wired playback when the battery dies. On the right, you’ll find buttons for power/play/pause/pairing, playback, as well as a microUSB port for charging. The TT-BH22 fold up nicely for travel, and there’s a nice hard case included with a pouch for carrying your charging and wired cable. These are nice additions for such an affordable headphone. Let’s start with the sound quality of the Taotronics TT-BH22. Overall, the tonal balance falls slightly on the warm side with punchy bass but a recessed mid range. Highs are slightly bright, but exciting. Those who can’t stand bright treble will want to stay away. Overall detail is soft, so don’t expect these to compete with audiophile headphones. Soundstage is equally mediocre with the sound concentrated around your head instead of creating a sense of space. We should note that the above sound impressions are with ANC turned on. Once you turn ANC off, the sound quality takes a noticeable dip. With ANC turned off, music sounds like you’re listening to a pair of speakers behind several layers of blankets, which means you’ll want to keep ANC on if you care about sound quality at all. However, strangely, the TT-BH22 sounds good with ANC turned off but wired, which means it’s the wireless audio tuning that results in poor audio quality. Homing in on the ANC for a second, it's definitely subpar compared to industry leaders like Bose and Sony. There’s a noticeable hiss when ANC is active and no music is playing. The headphones do a good job of cutting out some ambient sounds like fans, traffic, and other low frequency sounds but they don’t a very good job of drowning out voices or higher frequency sounds. We also felt a slight pressure with ANC turned on. Battery life is rated 25 hours, but we saw closer to 20 in our real world testing. The headphones will have no problem getting you through a couple of workdays on a single charge and is on par with wireless headphones twice the price. The Taotronics TT-BH22 won’t blow you away in any one feature or performance metric. However, when we consider the TT-BH22 as a package and take into account its bargain-bin price, we were shocked at how much you get for the money: For $70 (£60, about AU$86), you get ANC, long battery life, a nice travel case and decent sound (with ANC turned on). Sure, you get much better audio and ANC quality from competitors but you’ll be paying much more. If you have some more money to spend on headphones, the Plantronics BackBeat Pro 2 are excellent value and if you want the best noise cancelling in the business, you can’t go wrong with the Bose QuietComfort 35 II. Audiophiles will want to check out the Sony WH-1000XM2 or Sennheiser PXC 550 - both of which offer superb sound and excellent active noise-cancellation.